Oh Walgreen's you slay me! Like several other stores in town, our ever present Walgreen's drugstore has been going through a makeover the last year or so and is trying to be your one stop quick shop for literally everything. 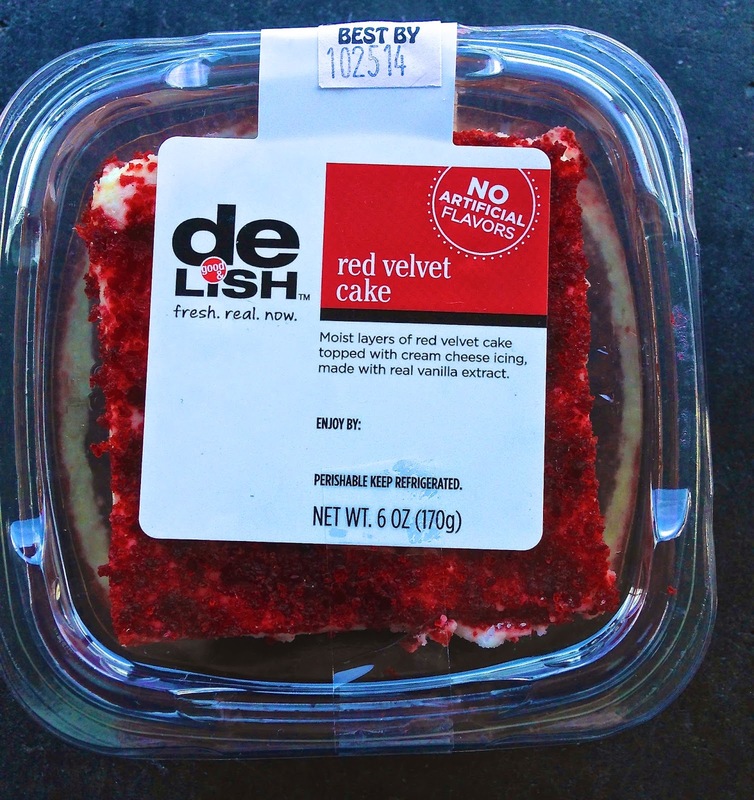 They are also reaching out to the grab/eat/go crowd with their own food imprint called "de-lish". It's their house brand name that covers any food related product--like generic but dressed up with catchy design. Part of this new brand included a couple new refrigerated dessert offerings like the ever present red velvet cake. 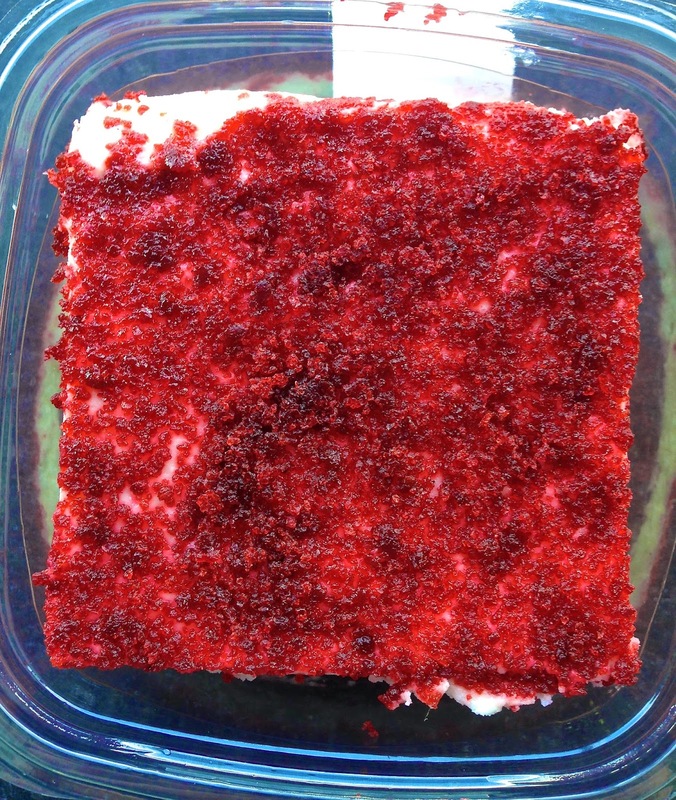 It's a square two layer cake with icing packaged in a little plastic container for $2.99. I was in a Walgreen's one day when I had a sweet tooth attack and saw this little cube calling my name from across the room. At first I was dubious but I bought it anyway. Right off the bat, after one bite, I actually liked it. Yeah, I know, crazy right. The cake was moist and there were basically two pretty thick layers of cream cheese icing. I even checked the label to make sure this was real and yep, there it was right in the ingredients. Though I would suggest if you are health conscious in any way to not read the label on this. It's best to either just eat and enjoy or not eat at all, there is no in-between here. The cover says real vanilla used and no artificial ingredients, but you know, red dye kind of is, so I'll personally just ignore it all. 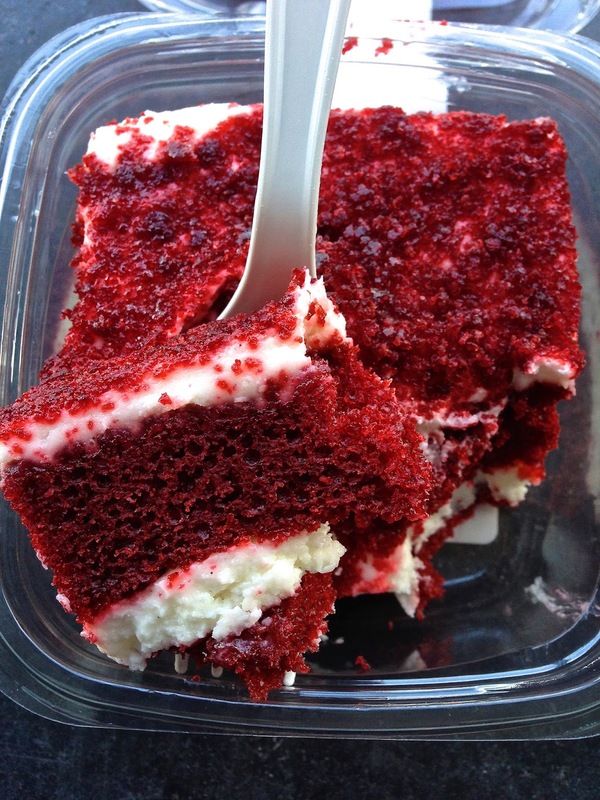 The cake also has the right flavor of being chocolate cake with red food color added instead of some white cake that looks bright red. (Always pass those by they are imitators!) Added bonus, even with all the stuff in it, it doesn't taste too terribly sweet either. Thus it won't make your teeth hurt, but your waistline might complain a bit. As an admitted junk food junkie, on occasion, I'll say this satisfied a spur of the moment sweet tooth moment. Would I always want this? No, but when the feeling hits and ones choices are limited, I like to keep this in my back pocket as an option since I can usually find a Walgreen's open when other places aren't. Underground dining hits the mainstream as Inside Scoop interviews an original. Local chefs name their favorite local desserts. Now that's a list I can get behind. Munchery and an SF chef go at each other over food storage. The Melt is doing burgers and other things now. I guess grilled cheese fast food wasn't working all that well for them? SFist eats some nachos then run down the city's best, so you don't have to, but should anyway. Thanksgiving hasn't even happened yet and already there's a Christmas ale out. Let's drink it anyway. There are three new bakeries in the East Bay. Ugh..they're really trying to make me go there. Chefs explain their fascination with cured meats, you know, besides the salt and no refrigeration needed thing. Under the radar pizza places? Maybe. But I'd hardly call Goat Hill unknown or underrated. Restaurant prices go up so kitchen staff can get better pay. That's a better reason than healthy SF.